The the awarded approach for the Video Analysis Mini Challenge is described in the paper "Video Visual Analytics of Tracked Moving Objects" and has been essentially extended for the article "Uncertainty-Aware Video Visual Analytics of Tracked Moving Objects" (see Publicatio�ns below). 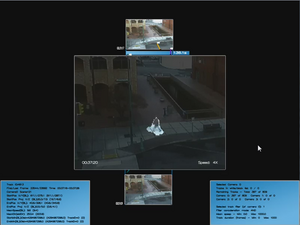 The Video Analysis Mini Challenge video file is encoded with the H.264 codec (video) and the AAC codec (audio). The Grand Challenge video file is encoded with MPEG4 video codec DX50 and the MPEG audio layer 1/2/3 (mpga).If you have any problems viewing the video sequences, you may download the VLC media player, including several useful codecs. Höferlin, Markus; Höferlin, Benjamin; Weiskopf, Daniel; Heidemann, Gunther: Uncertainty-Aware Video Visual Analytics of Tracked Moving Objects. In: Journal of Spatial Information Science (2011), S. 87-117. Bosch, Harald; Heinrich, Julian; Müller, Christoph; Höferlin, Benjamin; Reina, Guido; Höferlin, Markus; Wörner, Michael; Koch, Steffen: Innovative Filtering Techniques and Customized Analytic Tools. In: Proc. IEEE Symp. on Visual Analytics Science and Technology, 2009. VAST'09, S. 269-270, 2009. Höferlin, Markus; Höferlin, Benjamin; Weiskopf, Daniel: Video Visual Analytics of Tracked Moving Objects. In: Proceedings of 3rd Workshop on Behaviour Monitoring and Interpretation, S. 59-64, 2009.